Reminiscent of the early Victorian Gothic period in the 1800s, this inspired piece will be a gorgeous addition to your gothic home decor. 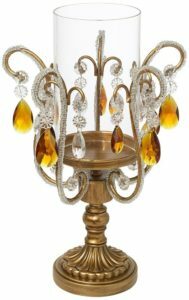 It’s a “traditional” hurricane lamp candleholder from the Kensington Hill home decor collection but with amber and clear crystal-like accents and carved details, it fits the more ornate early Victorian Gothic theme nicely. 15 1/2″ high x 4 1/2″ wide. Antique gold finish. Cast resin construction. Candleholder from the Kensington Hill collection. Faux crystal accents. Glass hurricane glass. Pillar style candle not included. Get your Victorian Gothic Golden Droplets Clear and Amber Crystal Hurricane Candle here. See other Victorian Gothic items to buy in our pic gallery. See all posts about Goth Gardening and Victorian Gothic life in our categories.